Philadelphia, August 7, 2018 – A new study in the American Journal of Pathology reports for the first time that injection of neuropeptide vasoactive intestinal peptide (VIP) directly into the eye of mice enhanced corneal graft survival. 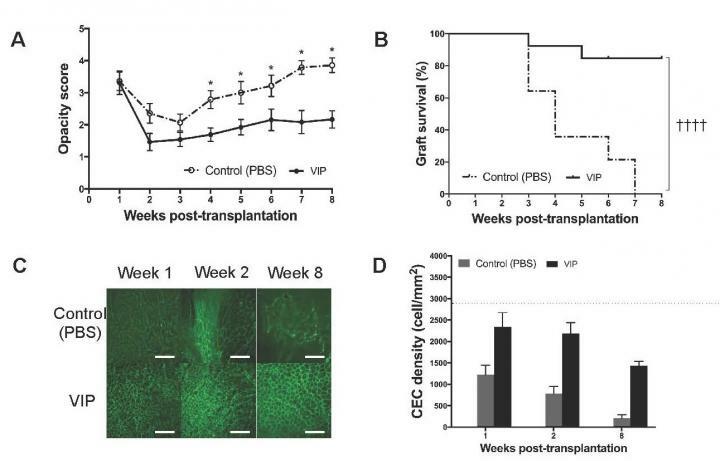 VIP produced other benefits, including acceleration of endothelial wound closure, protection of corneal endothelial cells (CEnCs), and improved corneal graft clarity. If proven successful in clinical studies, this novel approach may help alleviate visual loss in many patients with corneal disease.